About seven months ago I read Tim McMahon’s blog post about the benefits of his personal kanban. I decided that this was something I was going to try. I decided this was something I was going to try to improve my work. I spent a few months deciding how I was going to go about this before jumping in and trying it. Finally, I did give it a try. I wish I had better news, but my first and second iterations were not very successful. I tried using note cards and a bulletin board to move the work. I chose my value stream to be WIP Queue, In-Process, and Completed. 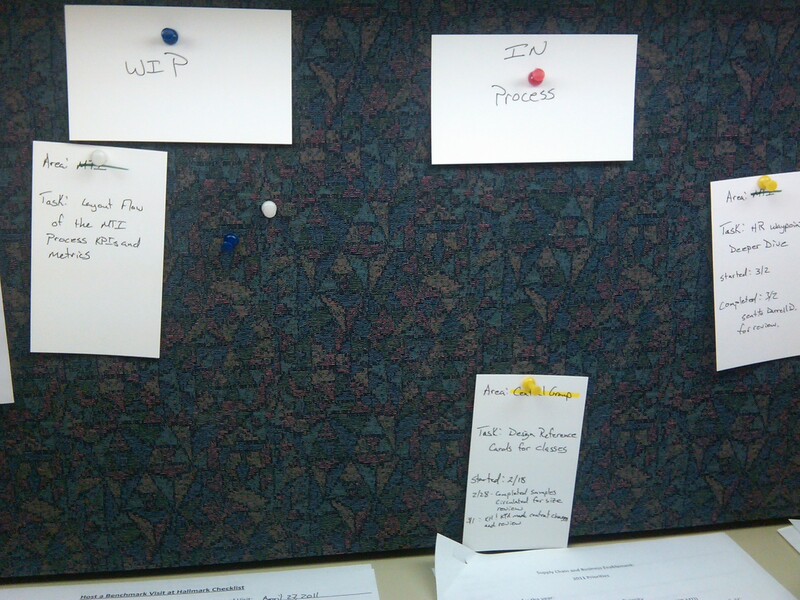 I color coded the tasks by which customer I was serving since my role is internal consultant. I found I was re-prioritizing the work on a constant basis, mainly because my customers were re-prioritizing their work. Plus, like Tim I don’t sit still. I am out in the manufacturing plants or in different parts of the main building all the time so I don’t get to see the bulletin board as much. I really liked my digital task list that syncs with my Blackberry. Having the tasks mobile was very helpful. I was also having trouble squeezing time in to complete these tasks, but I started blocking time off on my calendar to work on some tasks. In the end, the experiment was a failure. But, I did learn what worked and what didn’t and why. I still want to improve my work flow so further reflection and study is necessary. With Tim’s recent post about how and why he digitized his personal kanban, I was exposed to digital tools that I did not know existed. I will now take the time to look at some of the tools Tim presented and conduct some research of my own to figure out the best way to incorporate the right tools to help with my process. Find the tools to fit the process, don’t fit the process to the tools. Not all improvements work out and I think it is to highlight those and talk about those as much as the ones that did work. Happy improving! Posted on March 30, 2011, in Learning, My Continuous Improvement, Tools and tagged Digital, Inventory, Kanban, Learning, Tasks, Tools, WIP. Bookmark the permalink. 7 Comments. As I’ve heard it said, the place for learning is in failure. We don’t learn much from successes. Nice work. I like that: keep improving. Dennis, thanks for the encouraging words. I find it is important to share the failures too. We aren’t always successful and it is alright. We should re-enforce that. Matt, Nice post. It sounds a lot like my struggles. Good luck with the electronic tools. I am finding better success with these. Mobility and ease of access are key attributes to keep in mind. I look forward seeing your future improvements in your personal productivity system. Thanks for the mention and I am glad that it challenged you to experiment in your own way. I am definitely looking at other options. I am stuck in the middle. My company uses Lotus Notes and is very dependent on it as a way to schedule meetings, etc… But we are suppose to be moving to Microsoft Exchange/Outlook towards the end of the 3rd Qtr. I find Lotus cumbersome and it has syncing issues with my phone from time to time. Any suggestions would be appreciated. Nice post. Its nice to hear personal experience on wat worked and wat didnt. I am also looking for a way to get my work prioritized. I will check out the digital link.